(Bloomberg) -- U.S. stocks were at a record exactly six months ago. Going by the pace of the past few sessions’ advances, we could be making a new high before the March Madness college basketball tournament ends on April 8. The S&P 500 is 3.4% away from the 2,930 threshold, and we could be even closer had investors not blinked in the last hour of Tuesday’s session and turned a solid rally into a flat close. They can’t be judged: stocks are up 20% since late December, Jerome’s Powell dovish pivot and optimism over a trade war resolution are all priced in. To keep the stocks rallying or at least be where they are, we need the Fed to give investors a new dovish surprise. 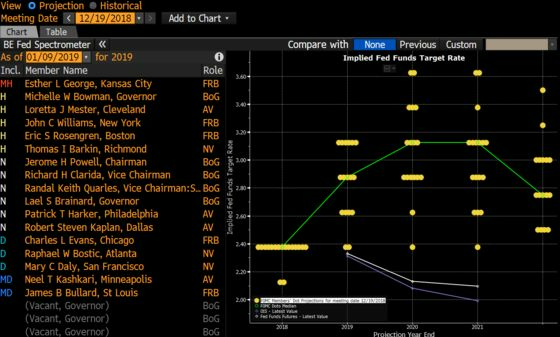 Traders are leaning toward a rate cut as the next move in 2019 and are fully pricing in a quarter-point reduction by the end of next year, Fed fund futures show. Policy makers’ median projection in their last update, in December, was for three more quarter-point hikes by the end of 2020. It’s expected that those estimates will come down, but the question is by how much. When policymakers made their last interest rate announcement on Jan. 30, the S&P gained 1.6% in what was the first gain on the day of a Fed decision since Powell took office. Stocks tried (and failed) to hold on to the 2,850 level for the first time since October yesterday, helped by a 12% jump in Advanced Micro Devices, on optimism that its processors will be used in Google’s video-game streaming service. (That news oddly enough has been known since January.) Clouding the sentiment today is FedEx, which is down more than 6% in early trading after cutting its annual profit forecast for the second time in three months on overseas weakness. 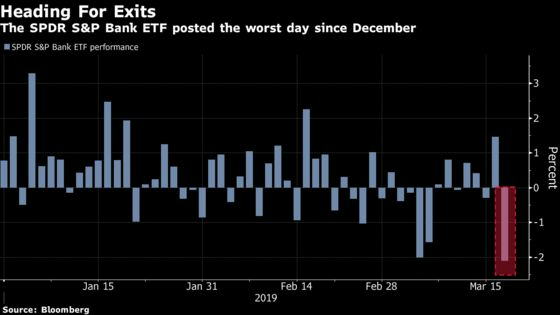 The bank rally has also sputtered, with the SPDR S&P Bank ETF posting its worst day since December. Banks will again be in focus ahead of the Fed’s decision. They steadily faded in Tuesday’s session, with the KBW Bank Index closing down 1.3%. Regional banks were among the worst performers, while the biggest “universal” banks -- with less exposure to a dovish Fed -- lost the least. Citigroup, with a 26% jump so far this year, and BofA, up 20%, are outperforming peers and the broader market. Rate-sensitive sectors will likely move on the Fed’s rate announcement. Watch the Utilities Select Sector SPDR Fund and the iShares Mortgage Real Estate ETF. Monster Beverage was downgraded to neutral from buy at Goldman Sachs, which wrote that U.S. sales could “remain softer than expected” in the near term, pressuring earnings expectations. The company, a long-time outperformer that has lagged recently, was also removed from the Conviction List at Goldman, which lowered its price target to $59 from $67. Analyst Judy Hong also cited higher commodity costs and increased competition as factors to be cautious about. Goldman is merely the latest in a series of cautious reads on the company. On Tuesday, Wells Fargo forecast muted growth following an analysis of Nielsen data. Earlier this month, BMO Capital Markets cut the stock to market perform, saying the valuation “may be as good as it gets” due to the “cloudier growth outlook” and competition from Red Bull and the energy drink Bang. Also this month, Citi removed Monster from its Focus List, seeing little room for upside while remaining “very bullish” on the company’s outlook. ~12:20pm -- AT&T CEO speaks at the Economic Club of Washington D.C.